The above script allows the product specification to be printed in full along with image and description. This Clinical Handbook provides a life-span assessment and treatment approach for individuals who have problems controlling their anger and are prone to engage in aggressive behaviors. It provides practical treatment steps and procedures on how to implement cognitive -behavioral stress - inoculation procedures. 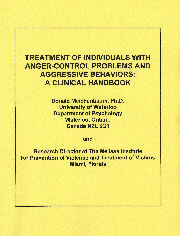 Included in this 446 page book are 25 Tables of “How To” Procedural Steps, Patient Handouts, Guidelines on How to Improve Generalization, an Appendix of How to talk an aggressive individual into a Social Problem Solver and an extensive list of related Website resources and an extensive Reference list. How to address co-morbid problems that co-occur with aggressive behaviors are also addressed. Tests of how to assess your level of expertise are included at the end of each of the five Sections of the book.